To get acquainted with the city jump onto The Peachtree Trolley, the 90-minute tour costs $30 for adults and $15 for children. Learn about the history of the city and see all the tourist hotspots from the comfort of the air-conditioned trolley. Once you have got your bearings head downtown to the Georgia Aquarium. The largest aquarium in the world it is like no other! The awe inspiring Ocean Voyager exhibit holds 6.3 million gallons of water, houses four manta rays, four whale sharks and many other species of fish. This aquarium is notably the only one in America to have manta rays. The 100ft long transparent tunnel and 23ft-viewing window make you feel like you are right under the sea! This is only one of the many exhibits at the aquarium, which is also involved in numerous research and conservation projects around the world. I have visited twice and would definitely go again! Next up visit the World of Coca Cola, next door to the Georgia Aquarium. 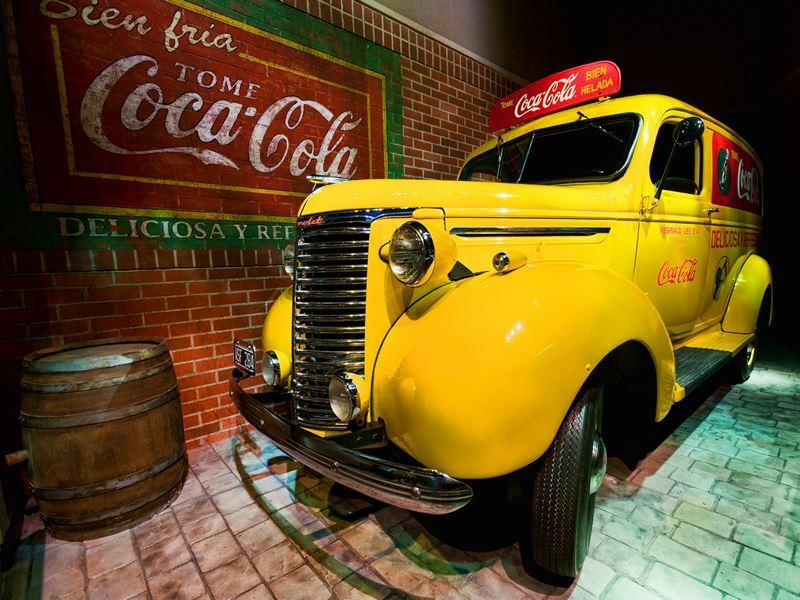 Dr. John S. Pemberton invented Coca Cola in Atlanta in 1886. On the interactive tour learn all about the history of this world famous drink, sample different flavours from around the globe and see how it is ‘bottled’ on a production line. You also get to take home your own commemorative bottle. For panoramic views of the city, take a ride on the Skyview ferris wheel. Individual pods provide lovely views from 20 stories high, great for photo opportunities. Open until 11pm on weekdays and midnight on Saturdays, this would be ideal for a romantic evening watching the twinkling lights of the city skyline. For something a bit different visit the CNN studios for the Inside CNN Studio Tour. Go behind the scenes and see how the news is put together. An adult tickets costs $15 for a 55 minute tour, I think this is pretty reasonable for such a cool tour! For $35 the Inside CNN VIP Tour allows you into Studio 7 where many of CNN’s daytime programmes are broadcast. You also get to see the CNN and HLN newsrooms and visit the HLN control room. Exciting stuff! A trip to Atlanta would not be complete without paying a visit to the Martin Luther King Jr. National Historic Site. Admission to the site is free and includes a guided tour of his childhood home. The tours are done on a first come first served basis so its best to turn up as early as possible on the day. 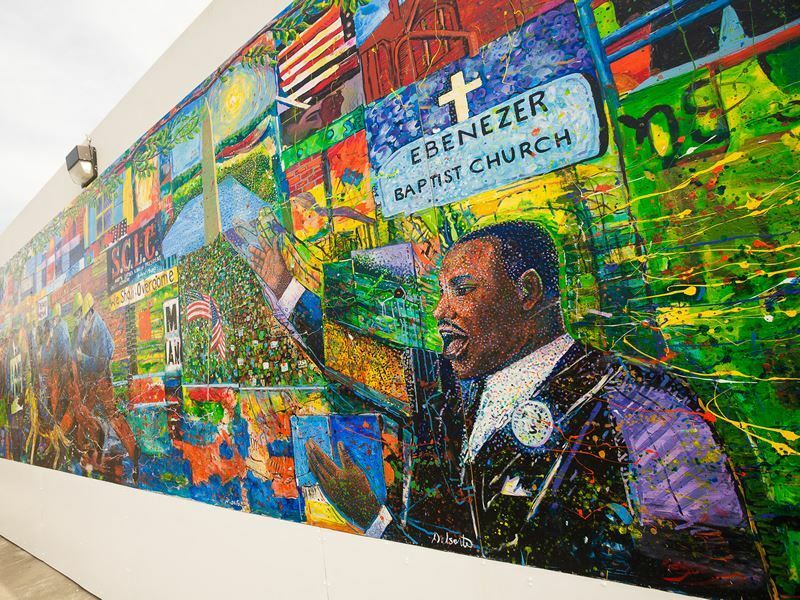 Take a self-guided tour of Ebenezer Baptist Church where he was baptised and later became minister and then co-pastor with his Father. The visitor centre hold exhibitions commemorating his life and work, there is also a world peace rose garden on site. After seeing the sights grab a bite to eat at Mary Macs. Open since 1945 it is one of Atlanta’s most famous restaurants. Try some traditional southern classics such as fried okra, barbequed ribs or chicken potpie. If it is your first visit ask for a complimentary cup of Pot Likker. This is left over liquid from boiling greens and ham hock and is supposedly very tasty and nutritious! For sundowners or after dinner drinks stop at SkyLounge at the Glenn Hotel. This chic rooftop bar has gorgeous views of the city skyline and an interesting cocktail selection. Afterwards check out Eddie’s Attic for live folk music and a bustling crowd. If you are into music and happen to be in Atlanta on 19th and 20th September don’t miss Music Midtown a two-day music festival held in Piedmont Park. Artists such as Lana Del Ray and Bastille are amongst the line-up. 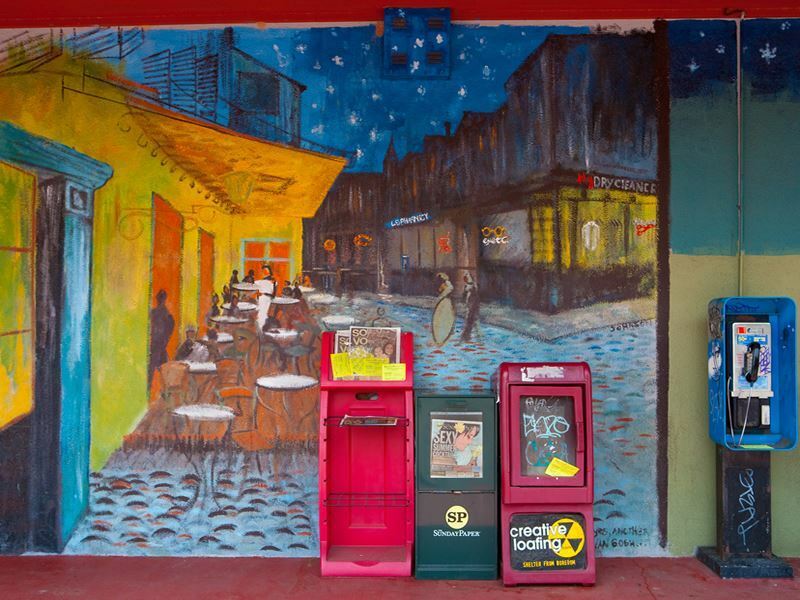 If you have a little bit of extra time and are looking for an alternative to the usual tourist sights then Little Five Points will fulfil your every need. A hippie neighbourhood on the edge of the city full of vintage shops, street performers, funky street art, bookshops, pubs and very quirky locals. It’s a great place to have a coffee and watch the world go by or pick up an interesting souvenir. Slightly further afield is Stone Mountain National Park, the Summit Skyride has incredible views of the Appalachian Mountain range, Atlanta and beyond and is the perfect way to ride to the top of Stone Mountain. Alternatively, a 5-mile journey around the mountain on a 1940’s train is a very cool option for seeing the gorgeous views. There are all sorts of exciting activities to keep children entertained within the park such as SkyHike, a tree top adventure course. Walking trails allow time to take the incredible scenery in at your own pace, through woods and past lakes. Finish the day off with ‘Lasershow Spectacular’, a laser show to music projected onto the side of the mountain. Back in the city, Atlanta Botanical Gardens in Piedmont Park is nice for a spot of relaxation. Chill out on the Great Lawn, climb high up in the treetops on the 600ft high Kendeda Canopy Walk or take a stroll in Storza Woods. A perfect way to end your 48 hours in Georgia. 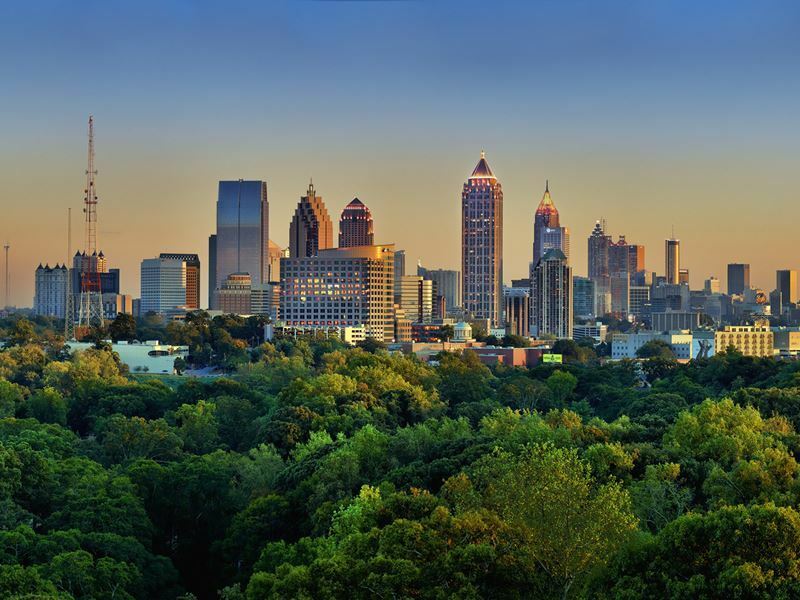 More information and to book: Rich in historical culture Atlanta, Georgia is a cosmopolitan hub that is teeming with attractions that celebrate Georgia’s heritage as well as inspiring fun for families and couples alike.